…an Hotel “quiet” …: the location of the hotel is enviable. – Certainly we are not the avenue to the sea, then have to walk two hundred meters straight sidewalk that separates us from the beach, but returning from a day under the umbrella our garden will seem an oasis of cool shade. – You will not be disturbed by traffic since the road is where we come out one way and little-used route, then nothing scoured sports car, no trumpeting of horns and impatient invective for those who are scrambling to park your car. – You will not be disturbed by bars or clubs that open early or close late, no gate of corrugated iron shop or garage, nor tram stops (it’s 100 meters …) only around houses and gardens. 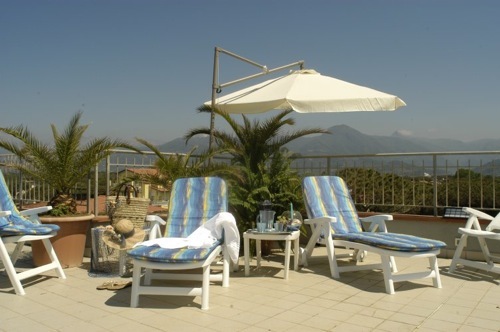 – You can not ask an overheated room with sea view (view those mountains!) But you will never have a “view of dark, shabby courtyard”. 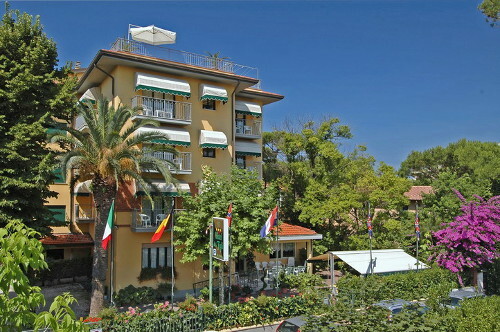 You can choose to turn off the air conditioner of your own room and sleep in a serene summer night with the balcony window open but will not have the company of ‘fragrant menu “of the pizzeria / restaurant / pub…che however reach walking in few minutes . Ah … I forgot … maybe you annoy the scent of croissants or tarts to cook for the breakfast buffet! You can not socialize with hundreds of customers, perhaps in line for the elevator (we only have one, too!) Or for the breakfast buffet … not simply because we have so many customers at the hotel! 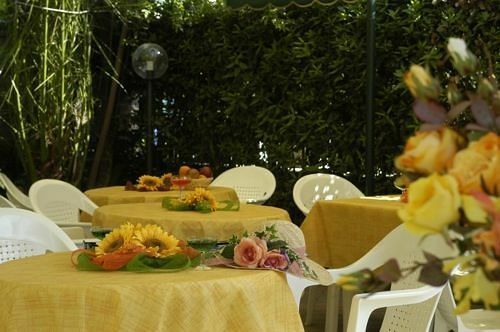 The friendly atmosphere will be shared only with our friendly and attentive staff and other guests twenty-nine rooms while sitting relaxed in the garden, terrace, and dine at the bar or wherever you want. Another thing we have is the pool beneath the windows of the bedrooms to let children play and clients diving and noisy at all hours. No, no. In its place there are chairs and tables where you can drink a ‘cocktail or coffee after a nice lunch of fish or meat …. A particularly happy location for those who wish to spend a relaxing holiday by the sea, a romantic break for couple or an holiday with the whole family.. The equipped garden or the panoramic terrace are a good alternative to the relax on the beach, maybe choosing from the agreement bathing establishments. 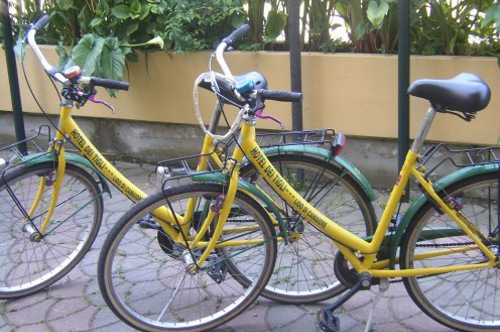 Bike available for short hikes and free internal parking with limitates places. Easily accessible from all over Italy, thanks ad'un excellent road link and motorway, Versilia is suspended between the Apuan Alps (abode for centuries the precious marble) and the sea.